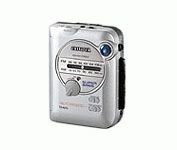 This is one of the best walkmans Aiwa has ever built, auto reverse means you don't have to flip the tape, I've owned this product for 9 years and still works like a charm with regular head cleaning and a belt replacement I put myself just 5 years having the product. This product has with stood abuse in my city living. Its an awsome product!